Ran a quick search and didn't find too much feedback on this. Looking into it as a little beginner sampler and the price doesn't look too bad at all for my budget. Any thoughts on this sampler for a beginner? I like em all except for the Gold, and the price works. That Casks are YUM.I do it. I mean buy it. Hm. I like 5 Vegas, but I'm not a fan of the gold and the gold maduro is only half decent. It depends what you like, but I'd prefer to see it with A and AAA in those spots, or maybe the Miami. I think maybe call/e-mail a rep and have them put you something better together. 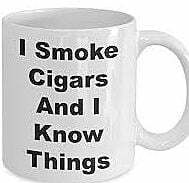 Unless you like mild cigars or are really new to cigars. Then this might work well. Yep. I prefer Tim B AKA The Beard. Awesome. Thanks guys. That's some great news. Also, stick around, do some reading and commenting, and let us know what you get and how you like 'em when you get to smoking. I buy that sampler every couple months just for variety. Do it. Is this true? So if I send Tim an email with a Budget number they can hook me up? Send him your budget and a general idea of what cigars you're looking for (brands, vitolas, wrappers, etc.) and he'll put together something. I'm not big on the flavors of the Gold Maduro but they are all solid smokes and worth trying...a great sampler if you've never had a 5V before. And for those smokes - $2/cigar is a good deal IMO. I like all things 5 Vegas I and the sampler did it it for me. Yes, it is true the Gold is very very mild, but you know something, on a lazy morning with a (good) good (good) cup of creamy coffee the Gold ain't bad. And, grasshopper, the Gold will get more body with aging. Can a conny really get more body from rest? In my experience they become weaker. You keep tellin' me that So should I connie-bomb you now while there's life still in them? Thanks for all the replies. I think I'll end up ordering it soon. I'll definitely post here once I give them a shot. this sampler is one of the best values ccom offers in my opinion. And if you pair it with a "daily deal" offering you'll have free shipping for both. I just smoked one of the big ones and it is definitely "less mild", been resting for only about 4 weeks. Or maybe the first few I smoked where an aberration, or maybe this one is, but it was stronger. The whole line of 5 Vegas is IMHO, one of the best bargains on CCom.